Heat beans according to package directions. Preheat oven to broil. Spread chips in pizza pan. Spoon beans over chips. Place shrimp over beans. Sprinkle cheese over shrimp. Broil for 5-7 minutes or until cheese is melted. Garnish with tomato and chives. Serve immediately. 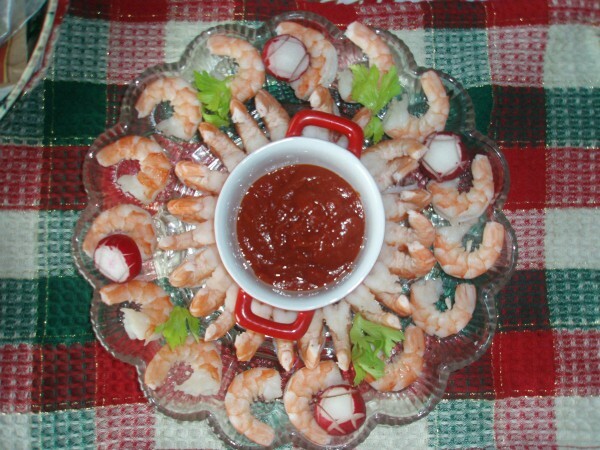 Just a little pretty idea to display your shrimp for the holidays! I used my deviled egg plate! Pretty, isn't it?